An iconic and historic route. Some of the most dramatic scenery in Europe and Asia. Three of the world’s largest countries. Epic adventure, experienced effortlessly. What makes your journey unique? The Great Wall of China, Beijing’s Forbidden City, Tiananmen Square, the Temple of Heaven. Outstanding Natural Beauty: Overnight stay in a traditional yurt in the Mongolian Alps on request. The cities of Ulan Bator, Ulan Ude, Irkutsk, Novosibirsk, Yekaterinburg, and Kazan. Open-air museum in Irkutsk and the Mongolian Alps. Moscow, one of the greatest cities on Earth. Russia’s proud capital, complete with tours of its world-famous icons and cathedrals, including the Kremlin grounds and Red Square. Moscow, one of the most vivid, dynamic and richly-historic cities on Earth. After a welcoming dinner, you experience the opulence and color of Moscow at night on a tour that includes the almost dream-like Red Square and famously palatial subway stations. Relax after your urban adventure in your central and comfortable top-range hotel. Overnight: InterContinental Tverskaya (or similar). Meals included: dinner (D). Wake up to morning in cosmopolitan Moscow. Visit the otherworldly Kremlin and experience the magnificent interiors of its glorious cathedrals. See the surreal and candy-cane Russian masterpieces of St. Basil’s Cathedral and Novodevichy Convent. You visit the lovingly reconstructed Cathedral of Christ the Savior, and pass by the notorious former KGB headquarters, the imposing architecture of the Soviet-era White House and Lomonossov University, before bidding farewell to this bold and charismatic city. Towards the evening, your train departs from the Kazan Station. Overnight on board. Meals included: breakfast (B), lunch (L) and dinner (D). Up close among the authentic Siberian villages, country lanes and wooden houses. Straight out of a fairy-tale, as if you’re in a picture book. Dramatic skies and mountain tops add to the sensation of witnessing a legend come to life. 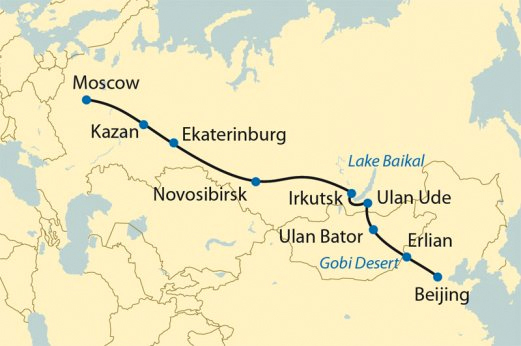 Journey with guaranteed lodging in the booked category aboard the privately-chartered train between Erlian and Moscow. Between Beijing and Erlian (ca. 16 hours). accommodation in a two- or four-bed compartment in a Chinese sleeper car. Two nights in a hotel in Beijing. One night in top-range hotels in Moscow. One night in a mid-range hotel in Ulan Bator and in Irkutsk. Excellent service and a three-guide system: tour director, group leader (max 26 guests per group) and local guides. An on board doctor (Chinese border to Moscow). All excursions and sightseeing as per itinerary, including all entry fees. All transfers and bus tours as per itinerary. All meals as per itinerary: Fine dining in the dining car and local specialties, such as Peking Duck. Porter service at all railroad stations. Information booklet on region and train in each compartment. Entertainment and culture: daily introductions to the country, people and customs. Reduction for May departure AUD 250pp. All rates are in Australian dollars but are based on the current exchange rate with the US dollar. These rates can change at any time without notice in line with exchange rates. All deposited bookings will be honoured at the AUD rate at time of booking. All prices are per person and in US dollars. We charge in Australian dollars based on the prevailing rate of exchange at time of payment. Prices do not include international flights.